Final preparations are underway for Crosspool’s annual Selborne Road street market on Sunday 28 June. The event is your opportunity to buy local food, cakes, plants, crafts, jewellery, clothes and books from over 40 stalls and also enjoy entertainment throughout the afternoon. During the market, Crosspool Art Group will be exhibiting in the garden at 55 Selborne Road where tea and picnic facilities will also be available. 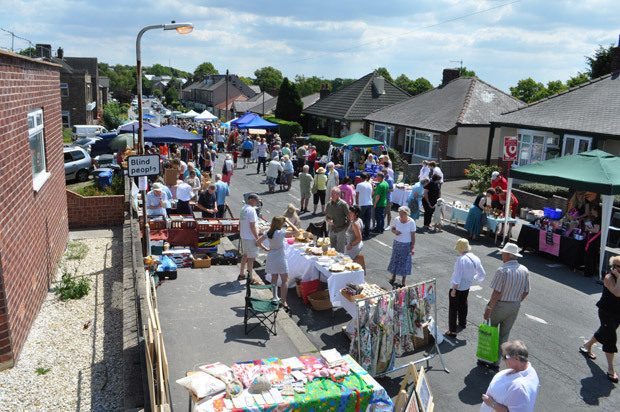 Crosspool Street market is open 12-4pm and is part of the 2015 Crosspool Festival. This entry was posted in crosspool, crosspool festival 2014, events, food, news, shops and tagged crafts, crosspool festival, direct travel, drink, farmers market, food, gifts, selborne road, street market. Bookmark the permalink. Enjoyed the street market yesterday, lots of things to buy at a reasonable price. Great hotdogs & the weather held out for the day!